M. Oehler, Nietzsches Bibliothek, [Weimar], Gesellschaft der Freunde des Nietzsche-Archivs, 1942, VIII + 56 S.,  Bl. 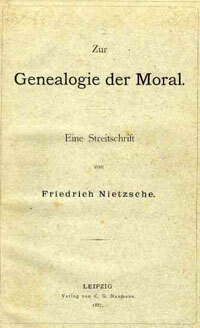 Beginning with the foundation of the Nietzsche archive in 1895, the discussions surrounding Niezsche’s work have been strictly intertwined with the study of the texts conserved in the philosopher’s personal library. In 1894 Elisabeth Förster-Nietzsche collected her brother’s books and notebooks, and left them in Naumburg before transfering them to Weimar in 1896, and she also began the work of transcribing and releasing the unpublished writings. In 1896 Rudolf Steiner, who worked at the Goethe-Schiller archive in Weimar, was designated by Elisabether to edit a catalogue of her brother’s books. The manuscript, still preserved at the Goethe-Schiller archive (GSA 72/2443), contains more than a thousand titles, subdivided by topic and with a summary for each book that describes the binding, number of uncut pages, dedications, and evidence of use. 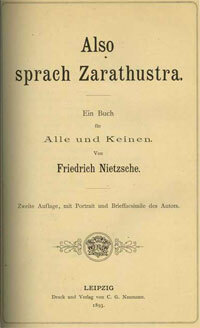 Following Steiner’s work, Elisabeth published on two occasions (1900 and 1913) a list of books that belonged to Nietzsche, in which she selected the texts arbitrarily, neglecting entire sections of the library (grammar, classical philology, and Greek and Roman authors) and reduced the total number of titles (see Elisabeth Förster-Nietzsche, Nietzsches Bibliothek, in Arthur Berthold, Hrsg., Bücher und Wege zu Büchern, Berlin u. Stuttgart, Spemann 1900; Hans Feigl, Deutscher Bibliophilen-Kalender für das Jahr 1913, Wien, Perles 1913). In the following decades, interest in the philosopher’s library continued. Hans Joachim Mette, the editor of the Historisch-kritische Gesamtausgabe of Nietzsche’s writings (München, Beck 1933 sgg. ), announced in 1933 that he planned to publish, as an appendix to the first volume, a new, exhaustive catalogue of the library (Hans Joachim Mette, Der handschriftliche Nachlaß Friedrich Nietzsches, Leipzig 1933, p. 54). However, the project never came to fruition, and there is no trace of any documents in Weimar related to Mette’s initiative. A few years later, in 1942, a new printed catalogue, edited by Max Oehler, of the books owned by Nietzsche was released (M. Oehler, Nietzsches Bibliothek. Vierzehnte Jahresgabe der Gesellschaft der Freunde des Nietzsche-Archivs, Weimar 1942, pp. 67). Oehler’s volume contains 775 volumes and 1621 titles, subdivided by discipline, with an appendix containing the books that Nietzsche borrowed from the university library in Basel. It is a lengthier catalogue than the ones produced by Steiner and Nietzsche’s sister, and also provides information regarding the underlined passages and marginal notes in each volume. For many decades Oehler’s register remained an indispensable working tool for anyone interested in Nietzsche’s reading habits or scholarly interests. Seventy years later, the publisher de Gruyter issued a new catalogue of the library (Giuliano Campioni, Paolo D’Iorio, Maria Cristina Fornari, Francesco Fronterotta, Andrea Orsucci, Nietzsches persönliche Bibliothek, Berlin u. New York, de Gruyter 2003, pp. 737). It provides, alongside the previous inventories, an even broader ‘panorama’ of the volumes in Nietzsche’s library that includes, for every book, notes on all of the pages that contains traces of usage. The de Gruyter catalogue also includes, for the first time, receipts from booksellers and bookbinders (conserved in Weimar) that demonstrate the purchase or binding of books that belonged to Nietzsche’s library and that, in some cases, later went missing. 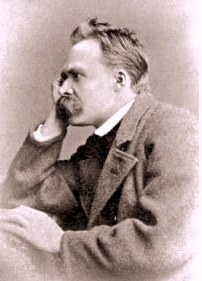 On the history of the catalogues of Nietzsche’s library, see the contribution by Paolo D’Iorio, Geschichte der Bibliothek Nietzsches und ihrer Verzeichnisse, in Giuliano Campioni, Paolo D’Iorio, Maria Cristina Fornari, Francesco Fronterotta, Andrea Orsucci, Nietzsches persönliche Bibliothek, Berlin u. New York, de Gruyter 2003, pp. 33-78.